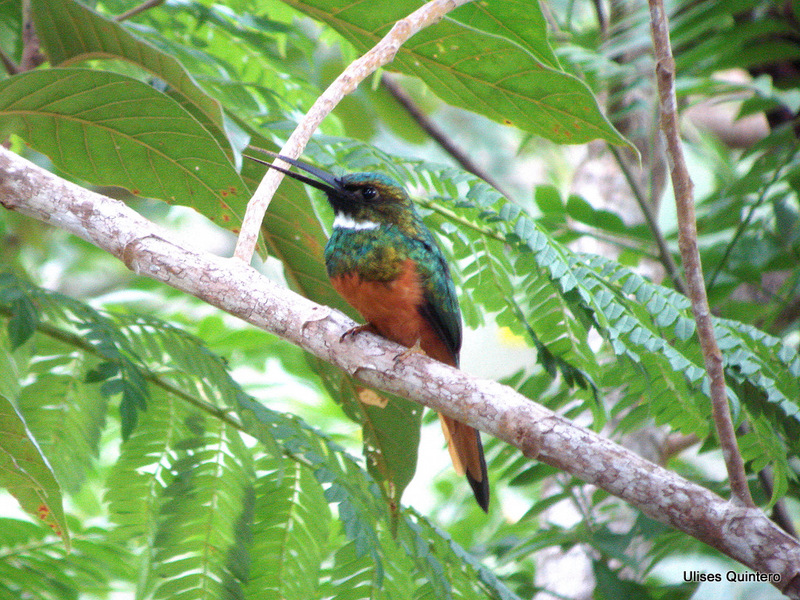 Some might say that the Rufous-tailed Jacamar (Galbula ruficacauda) is reminiscent of a Green-and-Rufous Kingfisher for its similar color patterns and heavy bill whereas others might see this bird and think of it as an oversized hummingbird. Whatever side you fall on it’s a species that you can’t seem to get enough of and is hard to turn away from for its brilliant colors and sassy attitude. 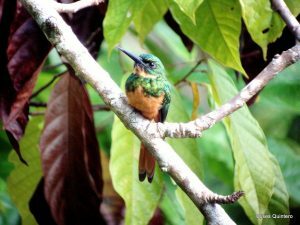 There are 15 species of jacamar in Tropical America which belong in their own family Galbulidae situated between the puffbirds and toucans. All belong to the order Piciformes along with woodpeckers and honeyguides. There are two species found here in Costa Rica, the Great Jacamar (Jacamerops aurea) found on the Caribbean slope and the Rufous-tailed Jacamar found at low elevations on both Caribbean and Pacific slopes. They are fairly common here on the Osa Peninsula mainly found along forest edges, streams and the open understory of tall second growth forests. It is also known to frequent cocoa plantations. We recently saw one perched along a road near one of our avian monitoring points on Friends of the Osa property in an area that we know as Arbolito. It is not as abundant as some species and so it is a special moment to come across one. They measure in at about 9 inches (23 cm) long and weight approximately 27 g. Those long bills are used for capturing insects. They perch on horizontal branches swaying their bill back and forth in search of flying insects. They are known to capture bees and beetles as well as large brilliantly colored butterflies such as Morpho and swallowtails. 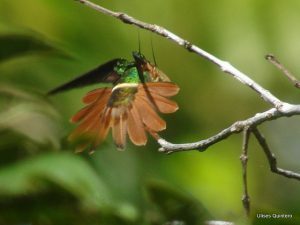 Their long beak allows them to grab hold of butterfly bodies while keeping flapping wings as well as bee stings at bay. Rufous-tailed Jacamars dig long burrows (11-20”) in a bank, the root mass of an upturned tree or a termitary in which to put their nest. Parents feed their 2 – 4 young during a 3 week nestling period by regurgitating insect parts. By the time the nestlings are ready to fledge the nest can look like a tomb of glittery insect wings and chitinous body parts. 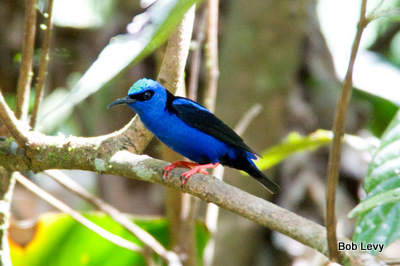 The Red-legged Honeycreeper (Cyanerpes cyaneus) can be found here on the Osa Peninsula and can often be seen wandering through humid forest canopies and open areas with its other Honeycreeper relatives the Green Honeycreeper (Chlorophanes spiza), the Shining Honeycreeper (Cyanerpes lucidus) and the Blue Dacnis (Dacnis cayana). 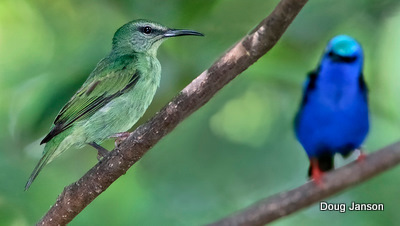 For those novice birders trying to get their bird bearings here in the tropics, one can at first glance mistake the Blue Dacnis or the Shining Honeycreeper for a Red-legged Honeycreeper. At least I did the first few weeks, but all you have to do is look for the distinctive red legs or the long decurved bill if you’re not yet Dacnis proficient. Also, one surprise that the Red-legged Honeycreeper has for any onlooker is the bright yellow color of the underneath portion of the wing. Honeycreepers used to be classified in a separate family with the Bananaquit and flowerpiercers, but are now part of the Tanager family which may seem a bit odd considering their nectar feeding habits and bill morphology. Any commentaries on why they were lumped with tanagers are welcome here by the way. But whether you’re a lumper or a splitter, tanagers display more colors and color patterns than any other tropical American bird and Honeycreepers definitely fit the bill. If you’re not sure what I mean find images of Golden-hooded Tanagers and Bay-headed Tanagers and you will see what I’m saying! Red-legged Honeycreepers extract nectar from the flowers of Inga, Calliandra and other legume plants. They also eat small insects, arillate seeds and many other fruits in fairly open edgy areas. We have seen them moving in mixed-species flocks high up in primary and secondary closed canopy forests as well as right in the gardens of the Osa Biodiversity Center at Friends of the Osa during our early morning avian monitoring point counts. This species is an open cup nester building a nest of fine rootlets and grass raising two young between February and June. Pairs are monogamous and both take care of incubation and nesting duties. Oh, and in case you’re curious Red-legged Honeycreepers weigh about 13.5 grams, about half the size of a House Sparrow. 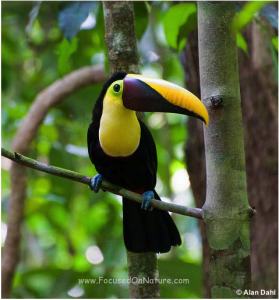 Visit Photographs by Bob Levy for more beautiful birds of Costa Rica. 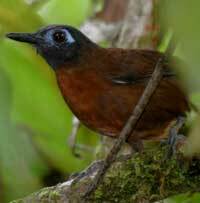 Not only does the White-whiskered Puffbird (Malacoptila panamensis) rank pretty high on the cuteness scale, it is also an interesting species from an ecological perspective. Puffbirds are most closely related to jacamars, toucans and woodpeckers. They are primarily insect and arthropod eaters and are considered to be flycatching birds along with tyrant flycatchers, and nunbirds. Even though they eat spiders, frogs and lizards taken from the ground they are known for sitting perfectly still in the forest understory until a flying insect meal passes by when it darts out to catch its prey in midair. It will then take it back to its perch to beat it against the branch before swallowing it. Their apparent lethargy, as they sit and wait for prey to come by, is really a honed hunting behavior. 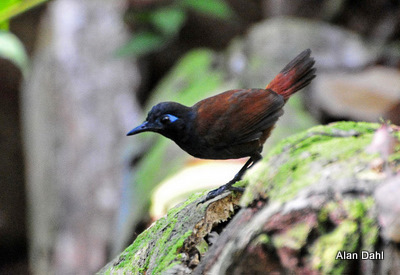 You can find either White-necked Puffbirds or White-whiskered Puffbirds here on the trails of Friends of the Osa’s Osa Biodiversity Center between Piro Research Station and the Greg Gund Conservation Center. Both species separate themselves vertically in the forest. You’ll find the White-necked Puffbird higher up in the canopy and the White-whiskered Puffbird down low where they don’t directly compete with each other for food resources. In either case however they are difficult to see for their stealthy style. Puffbirds build their nests in active termite nests or dig out a burrow in the ground or on the side of a small hillock with a short entrance tunnel with twigs and dead leaves extending out an additional 3 inches. The actual nest is lined with leaves. Those that build in termite nests seem to tolerate termites crawling all over them during incubation (From Alexander Skutch’s book of Birds of Tropical America, 1983). Ground burrows can be as long as 22 inches. 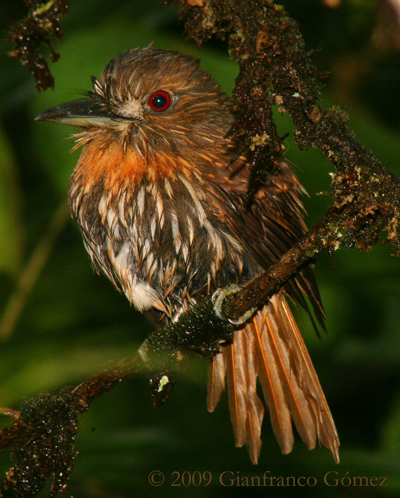 So why are they called puffbirds? As you can see from the photo, they are stout birds with fairly large heads and their feathers have a puffed-out appearance. When they get excited they puff out and swing their tail back and forth. Their abundant puffy plumage makes their short legs almost invisible. Note the striking red eyes as well! We would like to thank Gianfranco Gomez for allowing us to showcase his photographs. You can find more of his work at The Drake Bay Rainforest Chalet website. Have you ever been out at night driving along a country road and been startled by red ember eyes darting across the hood of the car, and then to have it happen every few hundred meters or so? If you are driving anywhere on roads, especially dirt roads, from South Texas on down to Argentina you are bound to see the Common Pauraque (Nyctidromus albicollis). 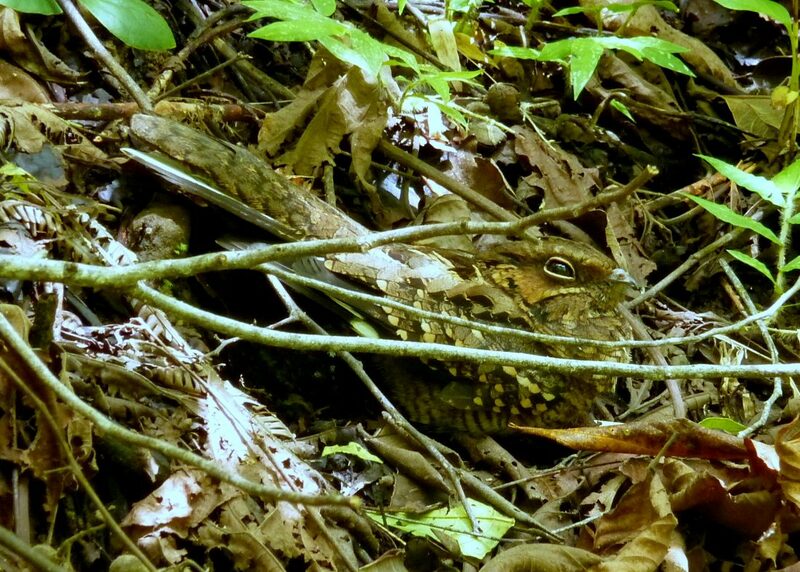 Here on the Osa Peninsula on the road to the Osa Biodiversity Center it is a common sight to see the nocturnal nightjar hunting along these roads or other open areas at dusk, dawn or during the night. As twilight approaches, Pauraques will position themselves on the ground which is a good spot from which to see insects backlit against the night sky, or on a favorite perch sallying around in search of the nights meal. They have very small beaks yet large gaping mouths with which to scoop up large insects such as beetles, moths and fireflies. The bristles around the face resembling whiskers are modified feathers which are highly tactile and controlled by muscles and are used to help hunt insects at night. They are likely there to also keep out-of-control insect legs and wings out of the bird’s eyes! This 11” (28cm) bird also has low wing loading which means their body is proportionally small to their large wings which makes them powerful flyers through wooded areas especially at night. The genus Nyctidromus gives the Common Pauraque its first name “night runner” describing its nighttime ground foraging behavior and the species name albicollis is in reference to its white throat patch. In various parts of Central America it is commonly refered to as “Don Pucuyo” or “Caballero de la noche” for its association with love. Some parts of Costa Rica call this species “Tapacaminos comun” meaning common road coverer. Here on the Osa Peninusla it is known as Cuyeo. There is lots of legend surrounding this and other nighthawk (goatsucker) species related to both love and darkness. Its cryptic browns, tans and buff coloration make this bird hard to see unless you are about to step on it. It will flatten itself close to the ground when danger approaches and then will flush at the last moment. It will then keep its eyes slightly open as you can see from the photograph to keep an eye on the possible ensuing predator. It places its nest of two eggs right on the ground with no pomp or circumstance usually in shady wooded areas. So why hunt from a country road exactly? Studies have shown that Pauraques will actually sit along the side facing the road and are more likely to be found there during a full moon which reflects light on the dirt surface making it easier to find and catch insects. You can find this and other photographs from Alan Dahl at Focused on Nature. The light morph bird was taken by me along the trail up on our Arbolito property just last week early August. This bird flushed from my feet and was very cooperative with her photo shoot allowing me to get quite close so I could bring you her image today. The Blue-crowned Motmots (Momotus momota) have been spending a lot of time around a Nance tree (Byrsonima crassifolia), a prolific fruit producing tree in the garden here at Friends of the Osa’s Osa Biodiversity Center. Lately there have been quite a few hanging around giving their distinctive soft low pitch “moot moot” call at dawn which has sounded like a large choral group, each bird with its own perfectly timed solo, and the group never missing a beat. With the Nance fruiting right next to the house, one of them actually flew through the front door the other day making me realize that it was time to share this species with you on the blog. Oh and by the way, he or she did find its way out of the house fairly quickly. In this species the male and female look alike and as you can see from Alan Dahl’s photograph, they are brilliantly colored. Motmots in general have two very distinct features worth noting: the racquet-shaped tail and a heavily serrated bill. The tail is more than half the birds total length and has two long central feathers. During feather preening sections of the tail barbs fall off leaving the exposed vane. The tip of the feather or the racquet remains intact forming what looks like a racquet head. Motmots are famous for slowly and methodically swinging their tail feather back and forth like a pendulum. The bill has tooth like serrations allowing them to take small snakes and lizards as well as other insects and tear them apart. They also accompany army ant swarms picking off what the other birds kick-up from the ground. And yes, they like fruit. A third and very interesting characteristic of the Motmot is the fact that they dig their nest into burrows. They are most closely related to Kingfishes and todies which also dig into burrows. Motmots excavate tunnels in the bank of a road or stream or in the side of a pit or hollow in the ground. Their nests are unlined and can wind as far back as 5 – 14 feet (1.5 – 4 meters). Now I don’t know about you all but I have a hard time seeing such a beautiful majestic bird digging a long tunnel in the dirt and coming out looking that good, but I truly hope to see it someday. 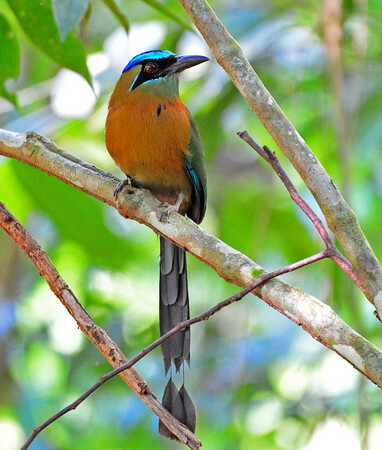 You can see the Blue-crowned Motmot all over Costa Rica, and at least at the moment, all over Cerro Osa on the Osa Peninsula. You can also find them from Mexico down through Argentina and in just about any type of habitat most often perched in the shade saying “moot moot, moot moot”! We would like to thank Alan Dahl for allowing us to showcase his photographs. You can find his work at Focused On Nature. This week’s bird, the Violaceous Trogon (Trogon violaceus) jumped out at me (not literally) as I was having my morning coffee on my front porch here at Friends of the Osa’s Osa Biodiversity Center on Cerro Osa. I was watching all the typical dawn action, mainly the Tropical Kingbirds and Gray-capped Flycatchers being overly vociferous when I saw another yellow bellied bird perched calmly on a Virola tree branch. This particular belly though was accompanied by a violet head, a beautiful long black and white barred tail and the distinctive yellow eye ring of the Violaceous Trogon. The female Violaceous is distinguished from her mate by her gray head and elliptical eye ring. I have since noticed that this male trogon as of late is always perched on that same branch every morning in its upright posture, not for long, but long enough for me to finish my coffee and get a good look. 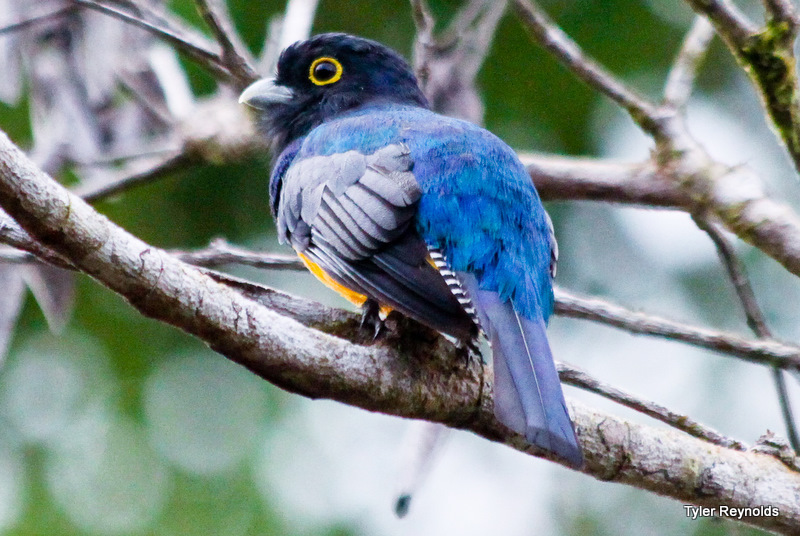 There are 40 trogon species in the warm regions of the world, ten of which are found in Costa Rica. Four species can be found here on the Osa Peninsula: the Black-throated Trogon, the Slaty-tailed Trogon, Baird’s Trogon and the Violaceous Trogon. You can see all four species here on Friends of the Osa properties. You just have to look very carefully as they can be somewhat still. You can find them in wet lowland forest and also along edges and open areas. They will hover to pluck fruit or insects from the vegetation and are known to eat wasps. In fact, Violaceous Trogons have been known to nest inside wasp nests, termite nests and arboreal nests of Azteca ants. Naturalist Alexander Skutch observed a pair actually nesting inside a wasp nest (vespiary). The Trogons built their own nest inside the vespiary in the early morning hours before the wasps became active. During the day the Trogons would hunt the wasps taking them from the air or from the surface of the vespiary. Interestingly, the wasps never drove the Trogons from their nest nor did the Trogons ever eliminate all the wasps, but they did successfully fledge young. You can find the Violaceous Trogon on either coastal slope of Costa Rica and it ranges from Mexico down through Amazonian Brazil. And yes, for those of you who may be wondering, the Resplendent Quetzal is also in the Trogon family and found in the Tilaran, Central and Talamanca Cordilleras here in Costa Rica. Keep an eye out down the road as I will also devote a page to the Baird’s Trogon since it is endemic to Costa Rica and Panama and vulnerable to extinction according to International Union for Conservation of Nature (IUCN). 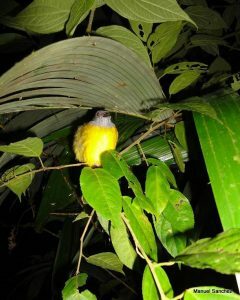 This week’s photograph was taken here on the Cerro Osa property just today by Friends of the Osa’s Tyler Reynolds.